Ask fellow campers about "McKinney Campground COE" and nearby attractions. Two stars, just for the lakeside campsites....but I can't recommend McKinney. Read reviews elswhere, they are accurate. Great campsites, but a deeply ingrained culture of rudeness and outright hostility - nothing like anyone's ever encountered at a campground. The often referenced "extremely rude lady" at the office is just that, don't bother smiling and being pleasant, that apparently makes her even ruder. Strict? I was TWO whole minutes late pulling out from our campsite, the guy who rolled up on his golf cart yelled at me. Then, to make things worse our dog, who never strays, was briefly off leash because I was about to get her to jump in the car...she ran up to the guy to be friendly and he erupted "That's an automatic fine for being off leash!!!" This was my next door neighbor's favorite campground - so close to home - but last time he was there his dog broke his collar and chased a deer, up towards the office. They made him pack out and leave right away, no warning. A couple I met on the way to Blue Ridge said they were at McKinney and out on their scooters, which are street legal throughout GA, and were told they couldn't ride them because they were "like golf carts". They have two dogs, a friend of theirs came to visit just for a few minutes to borrow their kayak and was denied entrance because he had his dog with them and that would have made 3 dogs...for a few minutes. And don't waste your time pre-registering, they will never glance at your registration printout. We're booked at our favorite site there later this year, but now that I know we can be kicked out for the slightest infraction with no warning I guess I'll need to change our plans. Very sad, and I will contact the Corps of Engineers folks to register our dissatisfaction. We camped at McKinney Campground COE in a Tent Trailer. Really enjoyed this park. We were able to reserve the whole loop from about 14-22 for a church group. This was a great loop on the lake. We had site 21. All of the sites right around here were very large and spacious. Nicely graveled with a steep descent to the lake. We were facing teh marina but it was quiet nonetheless. The only down side was it was an uphill bike ride or walk of about 200-300 yards to the bathroom. Showers were hot, bathrooms were average. We camped at McKinney Campground COE in a Tent Trailer. We love to camp throughout the Southeast. This campground is our go-to spot when we're just wanting to get away for the weekend. I thought I'd share our pleasure. We are locals in Atlanta and if we need a weekend away close to home, for whatever reason, we choose this place. The mainly large sites, the safety of locked gates at night, the wooded sites many with wood decks are why we continue to frequent this campground. We camped at McKinney Campground COE in a Tent Trailer. Once again, we're thrilled with our stay at McKinney. Because we live about 45 minutes away, this is our favorite campground which is close to home. It's very shaded, with huge hardwoods. Many sites have little trails down to the water. We stayed in site 103 which was great and off the beaten path. Gates close at 10pm, so make sure you're on the inside. We'll definitely continue to use McKinney! Oh, bathrooms are too far to walk to if in a hurry. This might not be a great place for little ones if you need to use their bathrooms. We camped at McKinney Campground COE in a Tent Trailer. We had a very nice stay. Sites are level and parking areas are paved. Lots of woods, fishing and wildlife. Bath houses are brand new and very clean. We camped at McKinney Campground COE in a Tent Trailer. This was our first visit to the park and we loved it. The campground was beautiful. The lake access at our site was a little difficult. There were large rocks that made it difficult to access the lake. We were able to do a little fishing here. There was abundant wildlife around the campground with deer, rabbits, ducks and geese. The front attendants were courteous and pleasant. No complaints from me. We camped at McKinney Campground COE in a Tent Trailer. Lots of restaurants nearby. Just be sure to return to the park before they shut it down at 10:30 PM. Any shopping you wish to do is available a short drive outside park. Restaurants also abundant outside of park in Acworth GA. Just expect congested roads and long waits at popular restaurants even during week-days, worse on week-ends. Good eating in old town Acworth, GA. The Tellus Science Museum is a treasure. Boating, swimming, fishing, hiking, SUP boards and all water sports. Great area for kids to play. Booth Western Art Museum in Cartersville is great. There are lots of firewood vendors at the 4-way stop near the campground. All their prices are about the same. 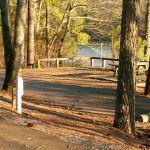 We used this campground as a home base for exploring Atlanta - it worked out perfectly, as it's only a 30-40 minute drive from downtown. There is also a great mountain biking trail nearby, Blankets Creek, about 30 minutes east - rated the #1 MTB trail in all of Georgia. Civil War and Locomotive museum in Kennesaw was great. Tellus Science museum in Cartersville; we did not get there this time but will next time. The Kennesaw National Battlefield Park is within 10 miles and is a good spot to visit and take a hike. The Burgerfi in Kennesaw is excellent and highly recommended for lunch. 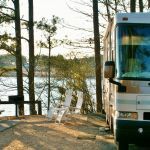 Are you affiliated with McKinney Campground COE ?